Lindberg/MPH announced the shipment of a box furnace with retort to a laboratory in Canada. The box furnace will be used to test parts in a hydrogen atmosphere. Lindberg/MPH announced the shipment of a box furnace with retort to a laboratory in Canada. The box furnace will be used to test parts in a hydrogen atmosphere. The atmospheric retort allows for uniform heating and less chance of contamination within the work chamber. 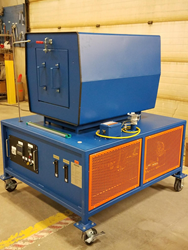 The temperature range for this laboratory box furnace is 100°C to 1200°C and the customer will run it at a maximum temperature of 1050°C The work chamber dimensions are 10.75” wide x 23.75” deep x 11.25” high. The lab furnace has individual heating elements at chamber top, bottom and sides for uniform heat distribution. This box furnace utilizes Moldatherm® ceramic fiber insulation to allow rapid heat-up, recovery and cool-down rates. High temperature insulation is used to minimize heat loss and improve temperature control. The inlet atmosphere is controlled through a flowmeter and nitrogen is used to purge the chamber before the introduction of hydrogen. Lindberg/MPH is a leading manufacturer of standard and custom industrial heat treat furnaces, including pit, box, IQ, and belt type for the ferrous markets. Lindberg/MPH also specializes in a variety of non-ferrous melting and holding equipment including but not limited to, aluminum melting furnaces, zinc melting furnaces, aluminum and zinc launder systems, crucible furnaces, and automatic dosing equipment. Lindberg/MPH customers cover a wide range of industries including aerospace/military, automotive, commercial heat treating, energy/oil, electronics and the forging markets. Founded in 1917, the company has more than 75,000 industrial furnace installations worldwide and their equipment is backed by a full range of customer support services and the most extensive replacement parts inventory in the industry. Lindberg is a proven leader in the thermal processing industry, with a long track record of proven policies and management practices. Lindberg/MPH is owned by Thermal Product Solutions (“TPS”), a leading American manufacturer of custom industrial ovens used for heat treating, finishing, drying, curing, manufacturing automation and process control. TPS is a global leader in thermal processing products and test solutions with brands including Baker Furnace, Blue M, Gruenberg, Tenney, Lindberg, Lunaire, MPH, and Wisconsin Oven. For more information on equipment solutions from TPS visit the website at http://www.thermalproductsolutions.com.